An 11th century source reports that the game of cards appeared in the middle of the T'ang dynasty (613-906) and that a certain Yang Tan-ien greatly esteemed the playing of cards, and that these cards had markings taken from dice. 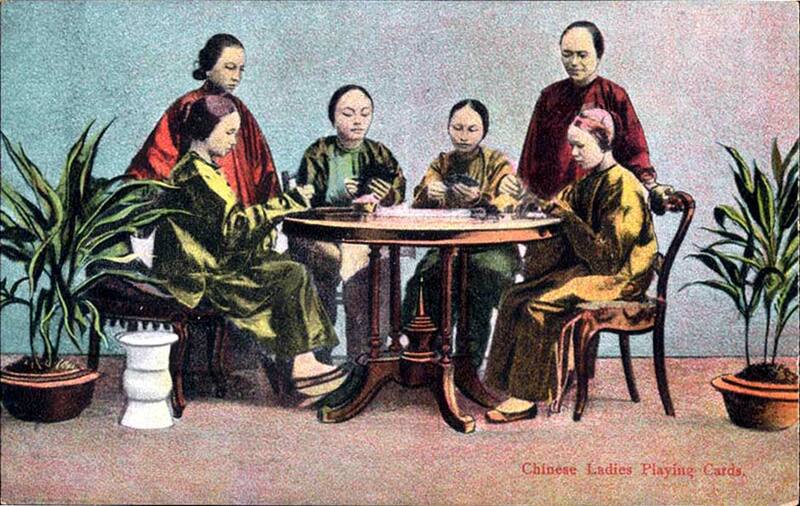 This evidence suggests that card playing began in China at an early date. Printing had also been developed in China as early as the eighth century for printing Buddhist texts, and later, banknotes or money printed on paper. 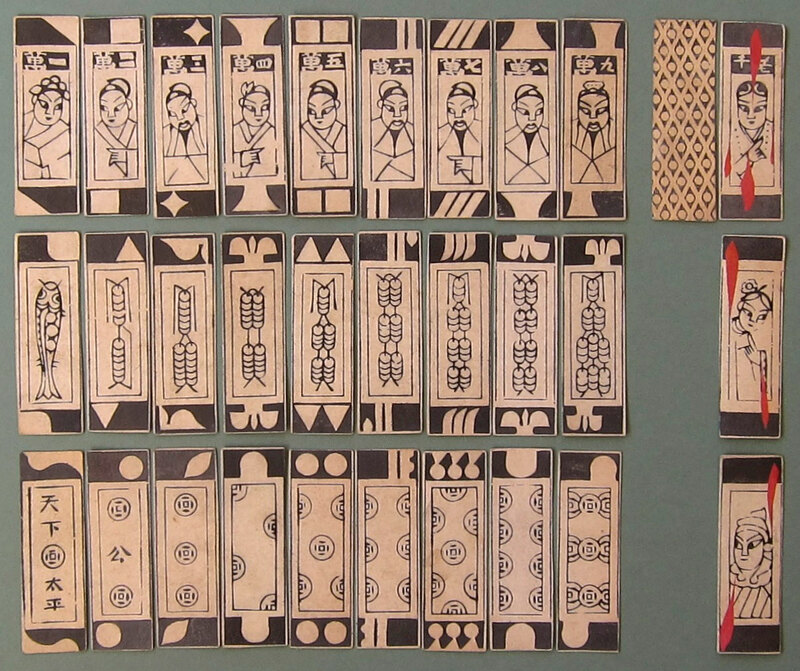 At some point playing cards were also printed from woodblocks. Another report dates from 1294, when Yen Sengzhu and Zheng Pig-Dog were apparently caught gambling in Enzhou (in modern Shandong Province). The law case notes that nine paper cards and thirty six taels of zhong tong period (1260-1264) paper currency were seized, along with wood blocks for printing cards. Our next source is from the writings of the Ming dynasty scholar Lu Rong (1436-1494), who notes that he was sneered at for not knowing how to play cards when he was a government student at Kunshan in modern Jiangsu Province. The Chinese word for Card, as in Cardboard is 卡 - Kǎ. However, for playing cards, the Chinese use the word 牌 = Pái. However, the same word also is used for dominoes, perhaps indicating that the earliest cards in China were but paper copies of dominoes. 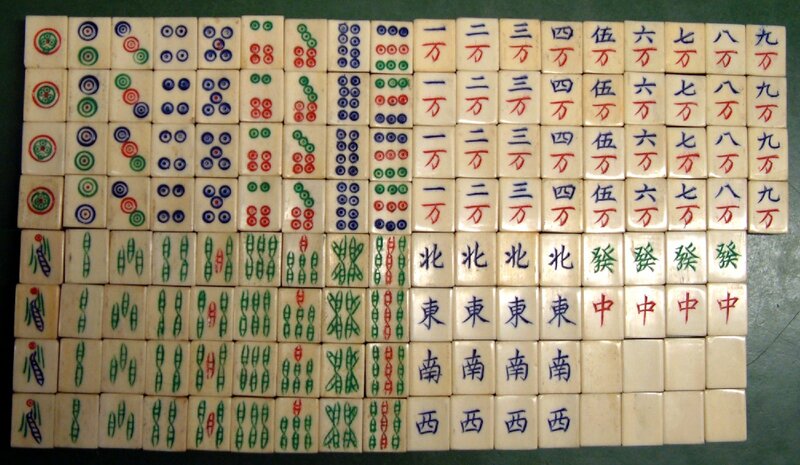 Hence, it is common to call dominoes 骨牌 (Bone cards), whilst playing cards (of paper) are called 纸牌 (Paper cards). We note that printed texts, paper currency and playing cards were all produced in China long before they eventually arrived in the West. Indeed, playing cards, religious images and decorated fabrics were to become the earliest applications of printing technology in Europe, following suit from earlier developments in the East. 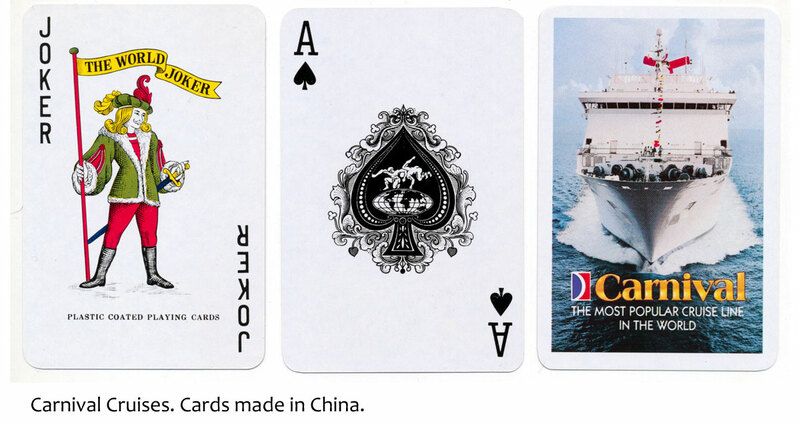 Shanghai is the centre of modern day playing card production in China. Between 1931 and 2010 more than 35 playing card factories existed in Shanghai, including several that have now closed. 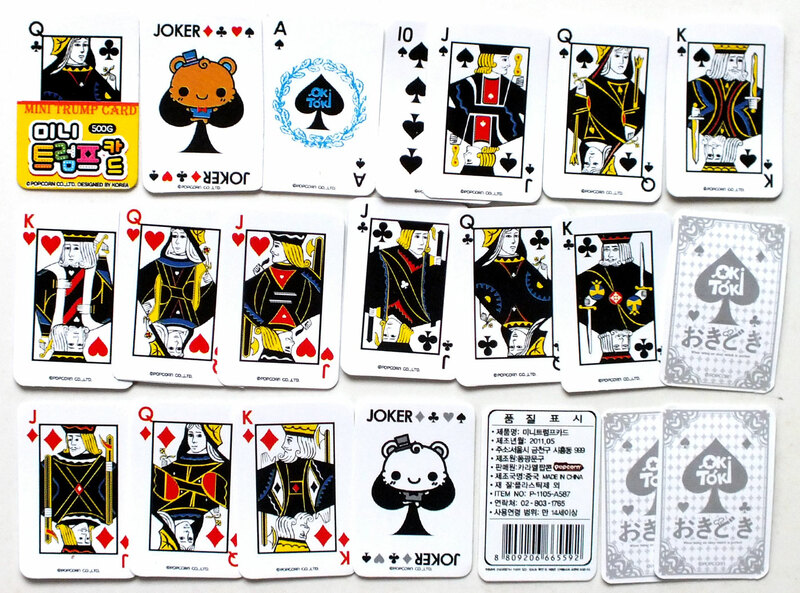 Today there are over 70 playing card factories throughout China. 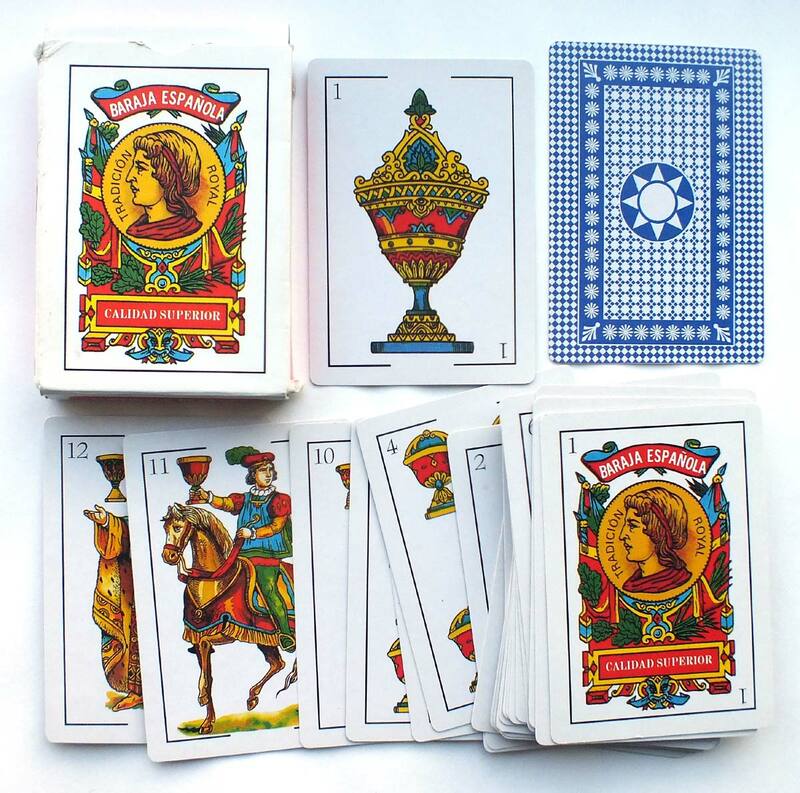 China has a large variety of playing cards, including cards featuring landscapes, animals, advertising, cultural or historic themes, and so on. 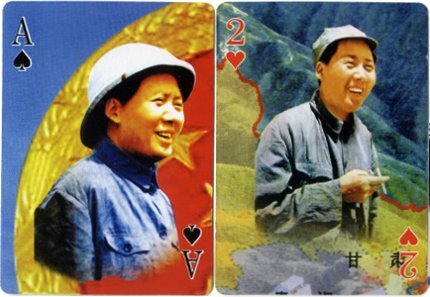 During the period 1966-1976, known as the Cultural Revolution in China, card games were generally prohibited and cards were no longer manufactured. When new factories started printing playing cards again in the 1970s the English indices A, K, Q and J were substituted by 1, 13, 12 and 11 respectively. These packs are now rather rare. Chinese people play a lot of cards in the streets. Sometimes when one player has lost his money the whole deck is thrown into the air. Above: 8 cards from an unusual chromolithographed Mah Jong pack, c.1910, in which the suits show 108 characters from the 'Story of the Water Margin'. 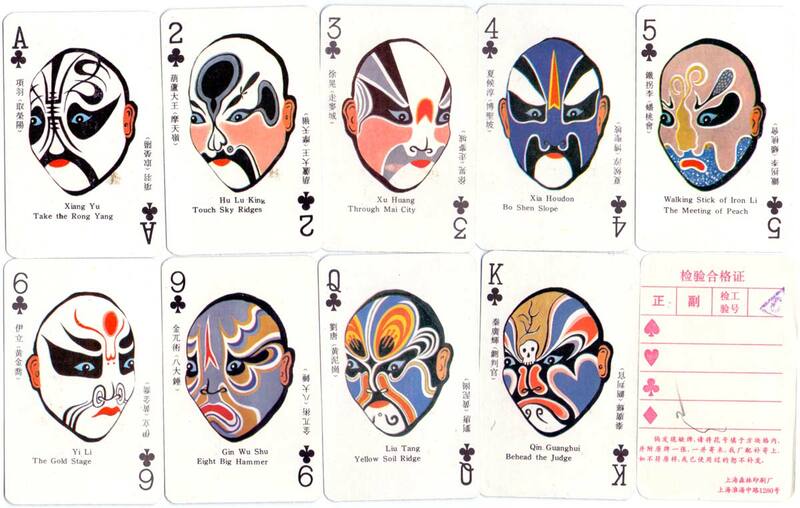 The suit sign, printed in blue, is the old form of 'wan', meaning 10,000, as shown on the higher ranking suit(s) of old money suited cards which traditionally showed the Water Margin characters. (Courtesy John Berry). The Chinese took their cards with them wherever they travelled and traded in the East, and we find Chinese cards in use not only in the mainland but also in Hong Kong, Malaysia, Indonesia, Taiwan, Singapore, North Borneo and Vietnam. A paper version of the tile game, Mahjong Cards are also played with in Japan as well as in many different parts of the world both by the local inhabitants and the Chinese settlers. 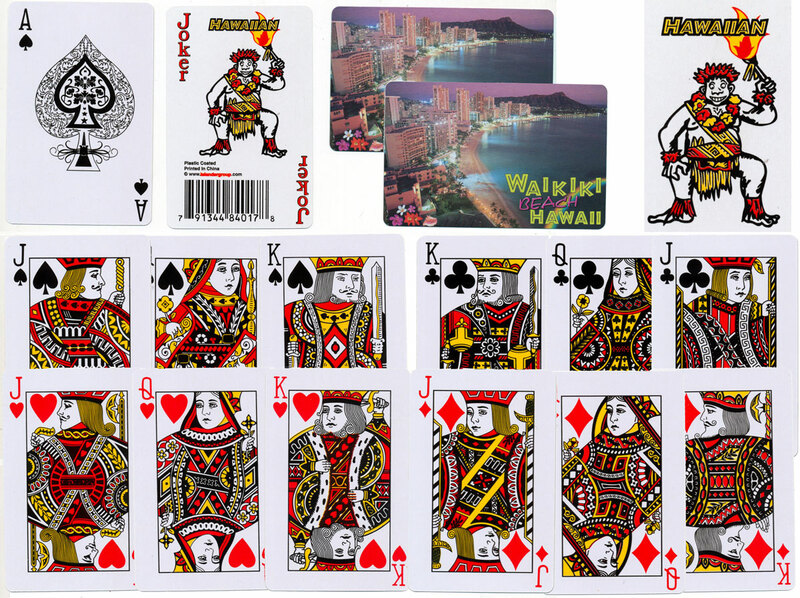 Above: modern Chinese KR brand Mahjong cards, manufactured by Qingyuan Wan Qi Poker Products Co., Ltd. and also marketed in Hong Kong See also: Malaysian Mahjongg Cards • Mahjong tile game. 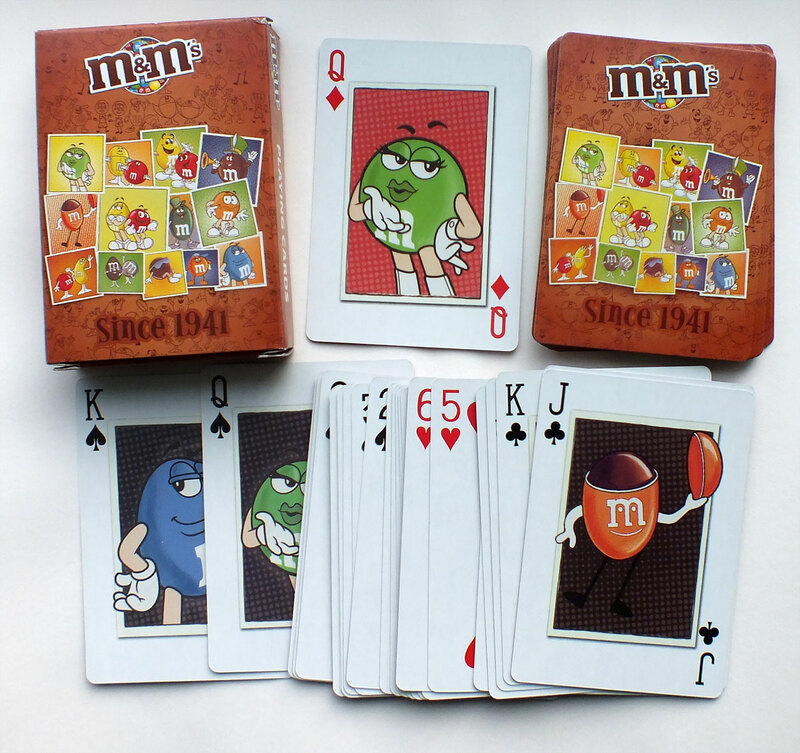 "Money-suited cards” refers to a family of playing cards which have three suits. Cards in this family include Mahjongg, the dongguan pai, and ceki in all it’s forms. These suits are coins, strings (of coins), and myriads. These three suits take their inspiration from old Chinese currency. Old Chinese coins had a hole in their centres. Large quantities of coins were strung up by their central hole for easy handling. In mahjong, the strings have been corrupted into bamboos, owing to their similar shape. The suit of myriads or 萬 is simply the next denomination of coins - units of 10,000. During the nineteenth century Belgian manufacturers (eg Brepols, Van Genechten) and also Camoin of Marseilles produced Chinese cards for export to South-East Asian countries including Java, Sumatra, the Celebes, Thailand, Vietnam and possibly China as well. Above: typical example of Chinese Chi Chi Pai, or Money suited cards, exported to Far Eastern countries by nineteenth century Belgian manufacturers. Above: "Dongguan Pai" from Dongguan, a place in the province of Guangdong (canton). 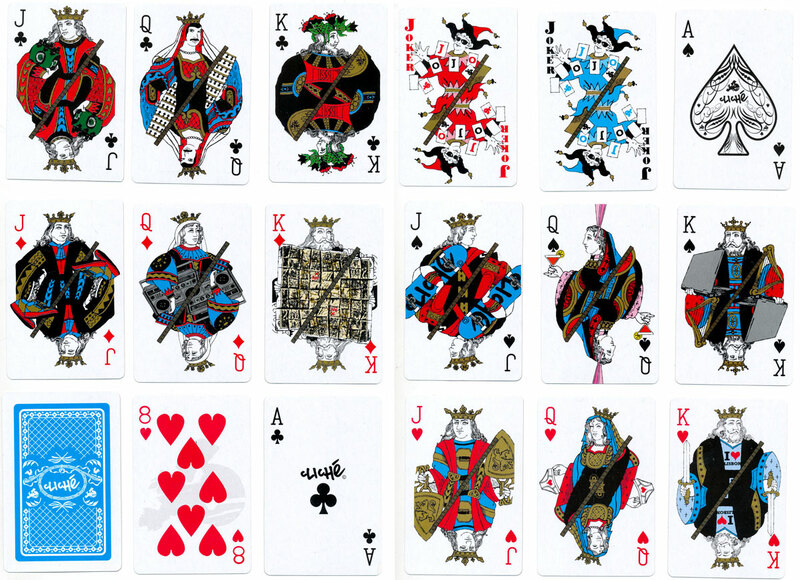 This "Money Cards" deck has 244 cards, comprising of 240 cards plus 4 "joker" cards. It is made by "Double Elephant brand". Fifth from the right we have the "white flower" the text on it reads "he xing, hongkong". The one to its right is the "little red" (xiao hong) it bears 3 red stamps and a little portrait of a man in the middle. Next to it is the "big red" (da hong) as before, it bears a picture of a man & 2 red stamps. 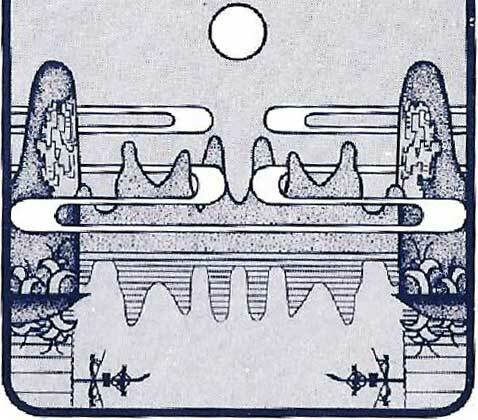 The one on the right is a joker, or "ghost" card, the text on it bears information about the maker. The back of the cards is plain orange (the cardstock is actually almost translucent). Images courtesy Anthony Lee. 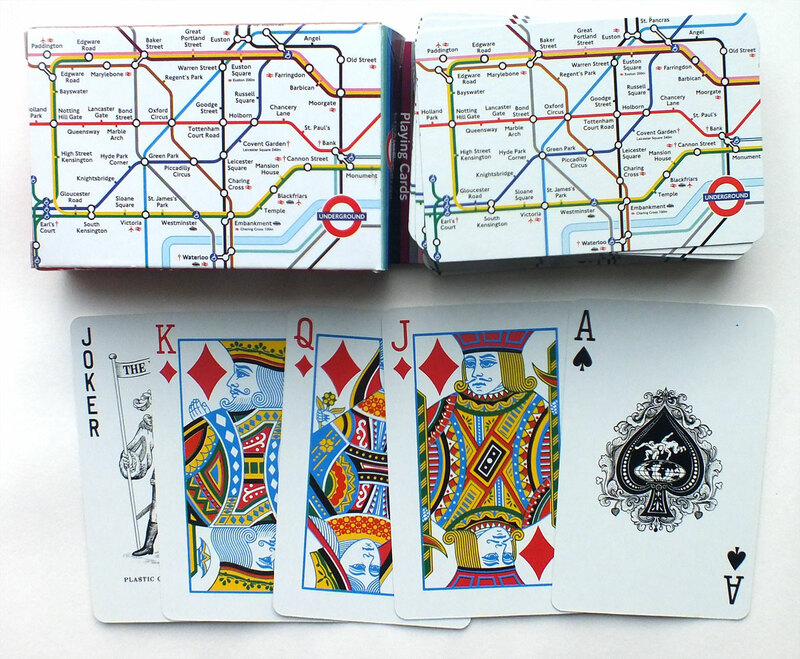 Right: a more colourful edition of Money suited cards; 5 sets of 30 cards, plus five cards with full-length figures and an additional card marked Wang Pai (trump card), total 156. Manufactured by Zhejiang Wuyi United Printing Company Limited, Zhejiang Province, on the eastern coast of China. Domino cards, deriving as they do from the 21 throws of a pair of dice, could be descended from the earliest known playing cards. Often these cards contain drawings of flowers, butterflies, animals, images from popular stories or lucky charms which embellish the otherwise rather dull designs. 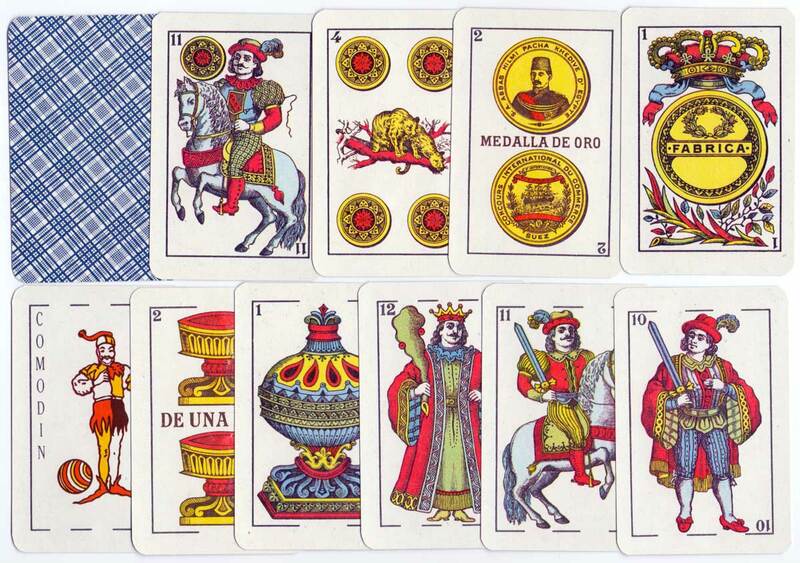 The cards where the pips are oriented vertically are called 十五胡. 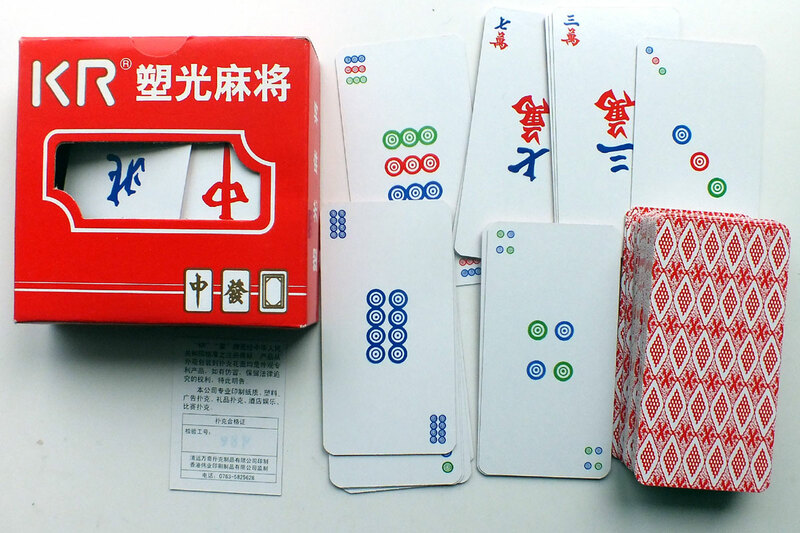 The ones where pips are oriented horizontally and have water-margin characters are called 川牌 Sichuan cards, after the part of China the cards come from. 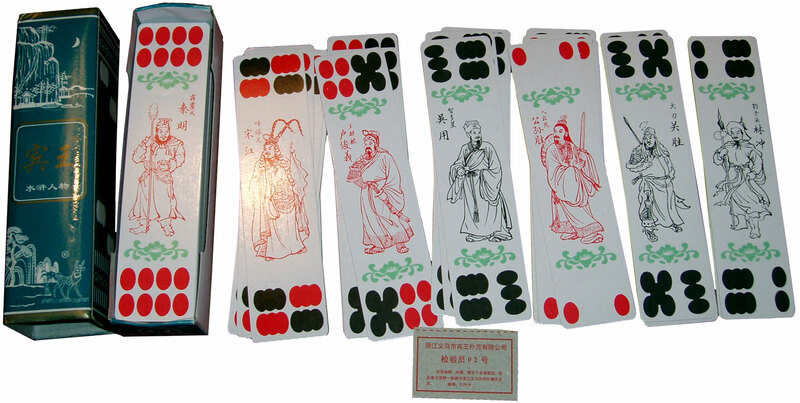 Above: Chinese domino cards featuring characters from the celebrated Chinese novel "The Water Margin" 水浒传. Above: Double Happiness Domino cards containing small symbols emblematic of the blessings of life. 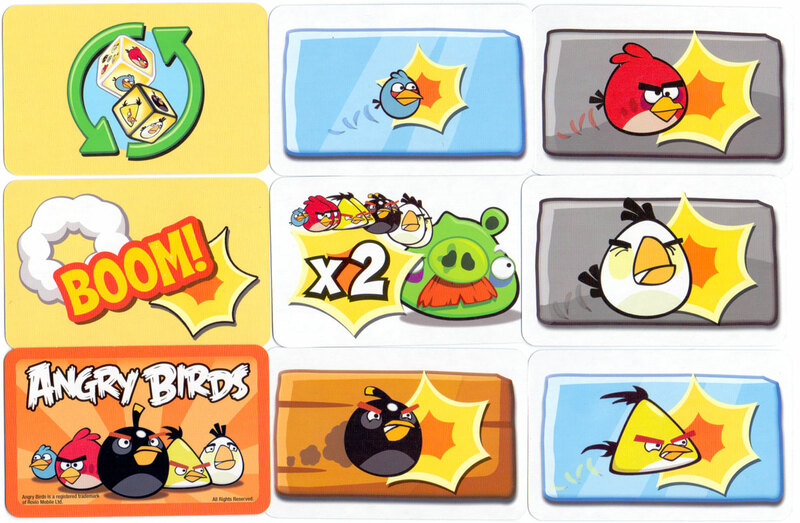 Another similar example is shown below; in this case the cards were exported to Hong Kong. The importer's name can be read on the side of the box. Click on image to zoom. Above: Chinese Character Cards described in "Catalogue of the collection of playing cards bequeathed to the Trustees of the British museum by the late Lady Charlotte Schreiber" published in 1901, p.193. Information courtesy Jonathan Will. 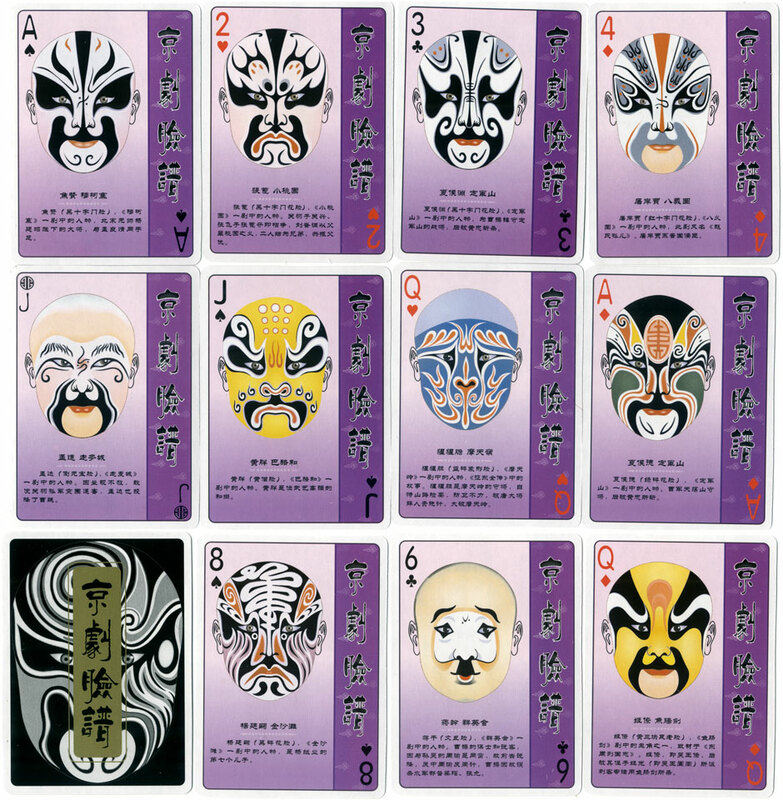 A further variety of Chinese playing cards is Chess Cards see example → See also: Chinese Fortune Telling Cards. 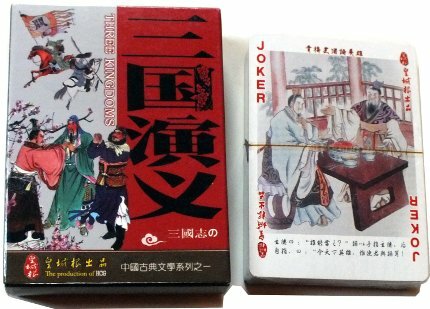 Above: cards from a double boxed set of 108 cards featuring Characters of “The Water Margin”. Image courtesy Matt Probert. 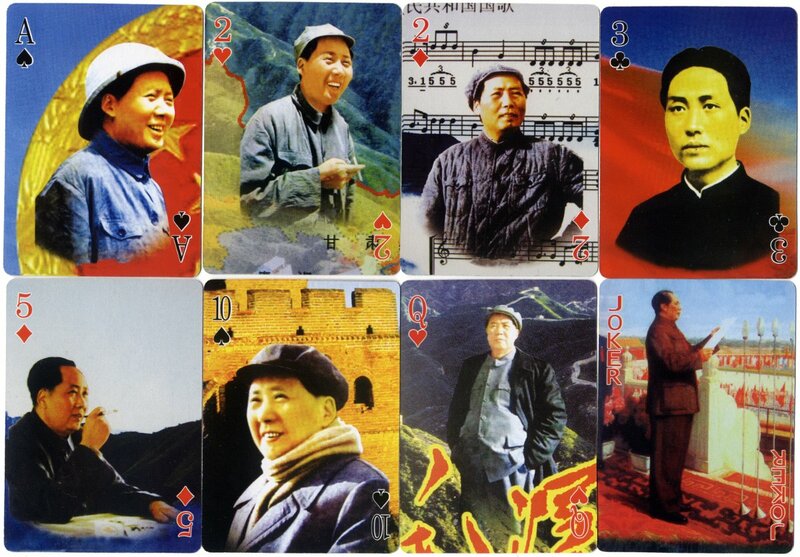 Great Leader Zedong Mao playing cards celebrate the story of the Chinese leader and statesman Chairman Mao, with pictures from different periods of his life. Produced by HCG Poker Productions. 52 cards + 2 Jokers. 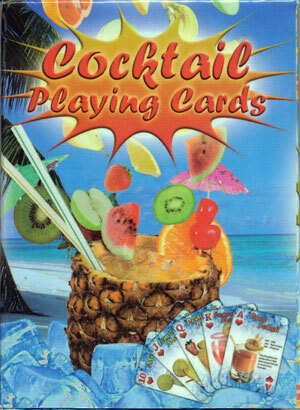 Above: Cocktail playing cards are a contemporary low-cost deck of playing cards manufactured by an anonymous Chinese firm and imported into Europe by the German, novelty household goods importer ‘Out of the Blue’. 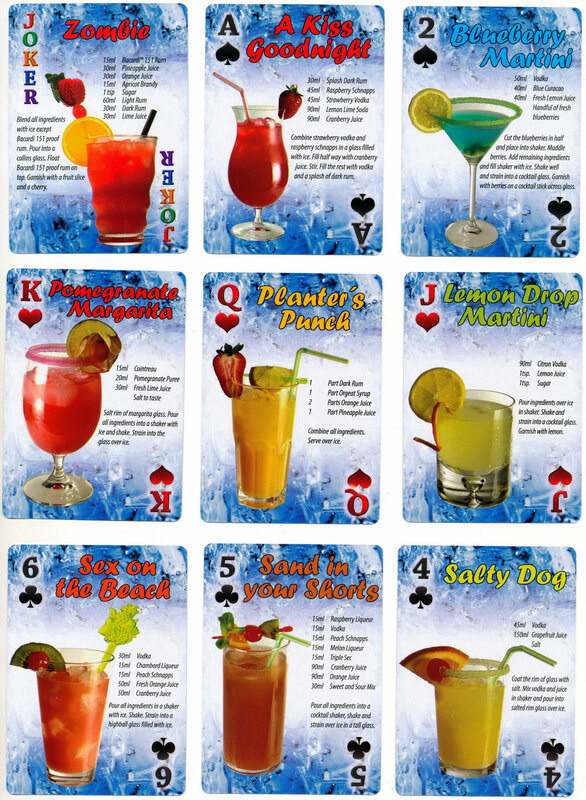 The deck comprises 52 cards plus two jokers, and each card features the recipe and illustration of a different cocktail. Sadly ‘Harvey Wall banger’ has been omitted, but recipes for the classic Martini, Margarita and Long Island Iced Tea are among the fifty-four recipes included. Courtesy Matt Probert. Chinese opera is one of the oldest dramatic art forms in the world. Different styles of facial make-up painted on each performer's face symbolize a character's personality, role, and fate. The technique may have originated from ancient religions and dance but facepainting including glitter dusts and henna art is very popular today at children's parties and street carnivals, without the permanence of a real tattoo. 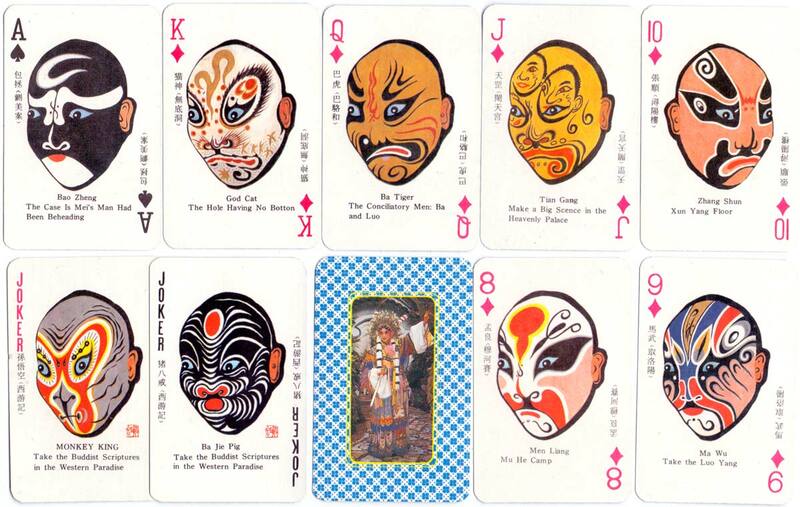 Above: two different examples of Chinese Face Painting playing cards. 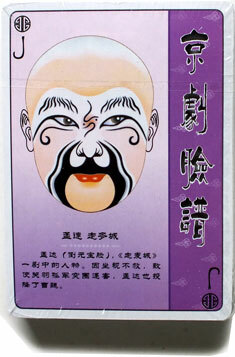 Above: face-masks representing Chinese gods. 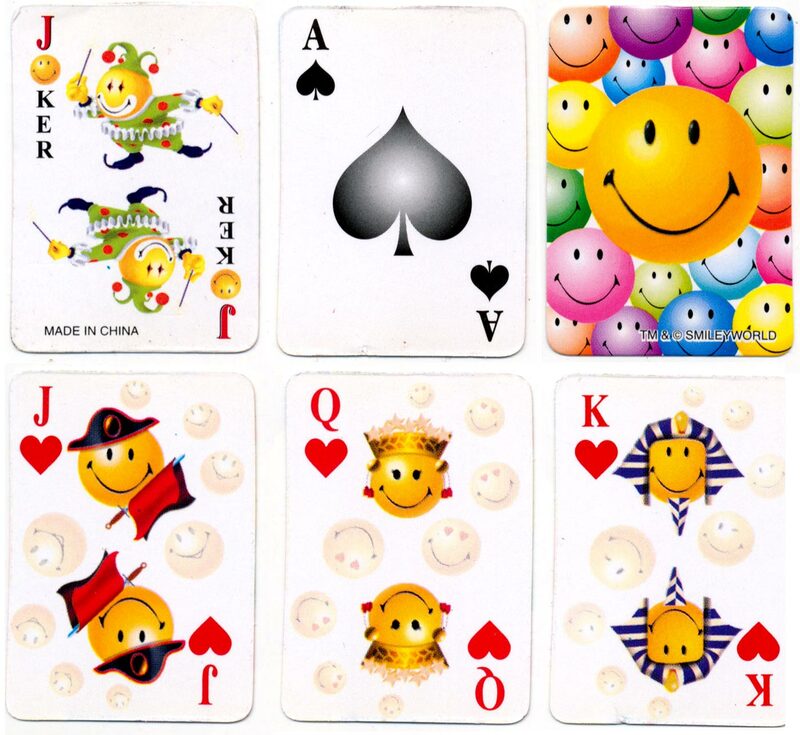 As can be seen from the above, a large number of playing card manufacturers based in China export playing cards and card games world-wide, in all styles and patterns. Today there are over 70 playing card factories throughout China. 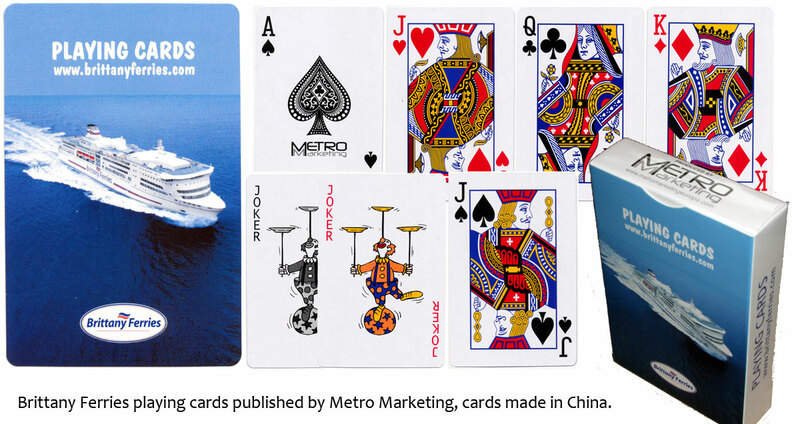 These include: Guangxi Credit International Trade Co. • Lanxi Caixing Poker Co. • Shanghai Diantian Printing Business • Shenzhen Senfutong Paper Co. • Shenzhen Wangjing Playing Cards Paper Co. • Wenzhou Jinyi Printing Co. • Wenzhou Tiange Printing Co. • Yiwu Xinhua Playing Cards Factory • Zhejiang Wuyi Tiantian Printing Co. • Zhejiang Wuyi Yaoju Paper Producing Co. 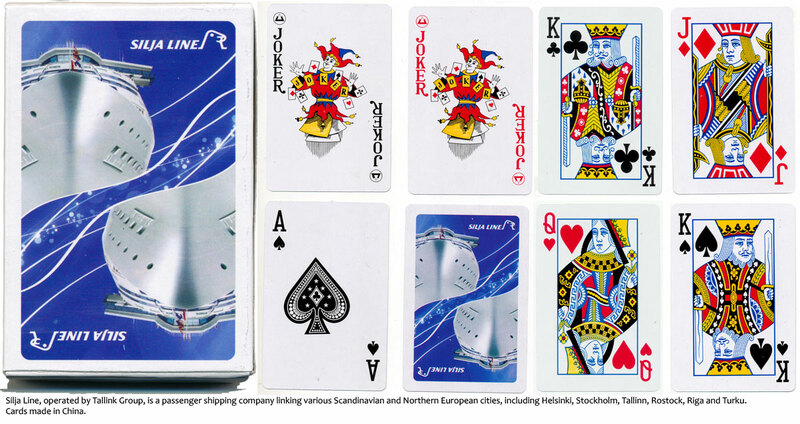 Many of these companies manufacture playing cards for European producers and distributors. 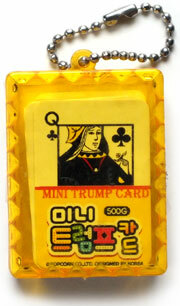 Above: "Mini Trump Card" key ring playing cards, published by Popcorn Co. Ltd, made in China, 2011. Above: Li River Souvenir Cards made in China. 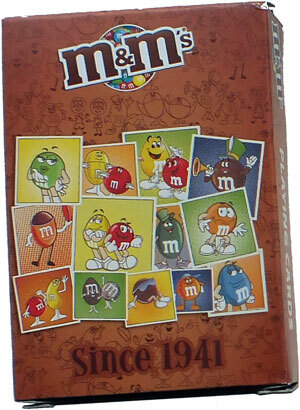 Above: M&M's Playing Cards made in China. 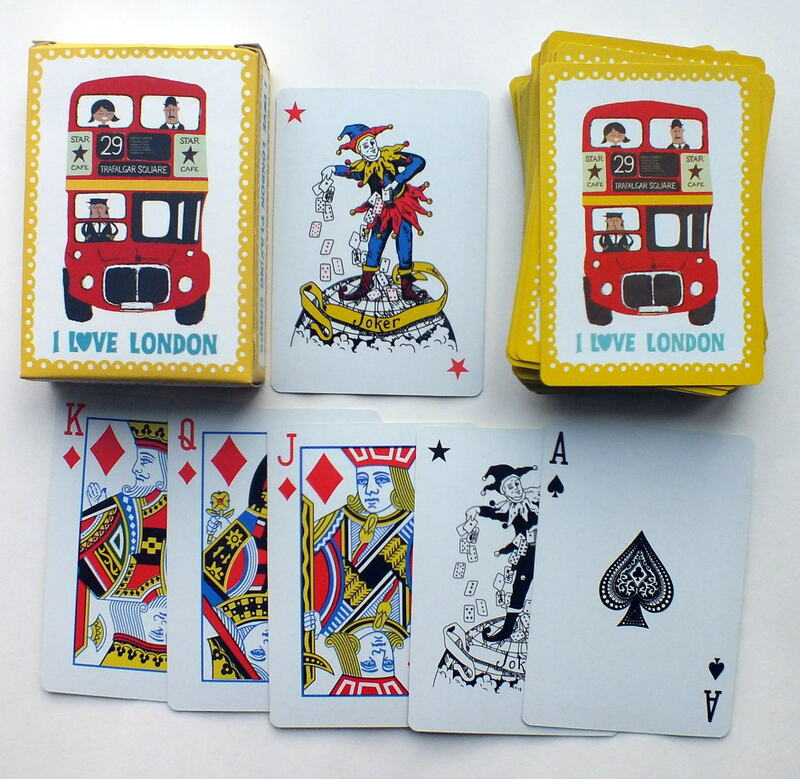 See also: London Underground • I Love London • 'Giraffe' Spanish cards • Silja Line shipping • Brittany Ferries • Carnival Cruises • Waikiki Beach, Hawaii • Cliché Skate • SmileyWorld • Baraja Española • Maxi Puke • Magic Poker cards • Chinese Dragon Robes.